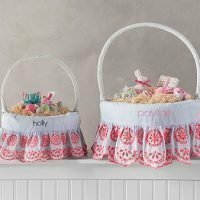 Easter Inspiration: Inexpensive and creative ideas for infant and toddler Easter baskets, Easter breakfast table decor, and Easter food. Spreading a little Easter cheer with you today! We’ve been spending quiet Easters at home the past 6 or 7 years and we LOVE hanging out in our jammies all day. Growing up, Easter was a very formal holiday for my family: dresses, hats, suits, fancy shoes. But as adults, we’re just not into all of that. Anyway! 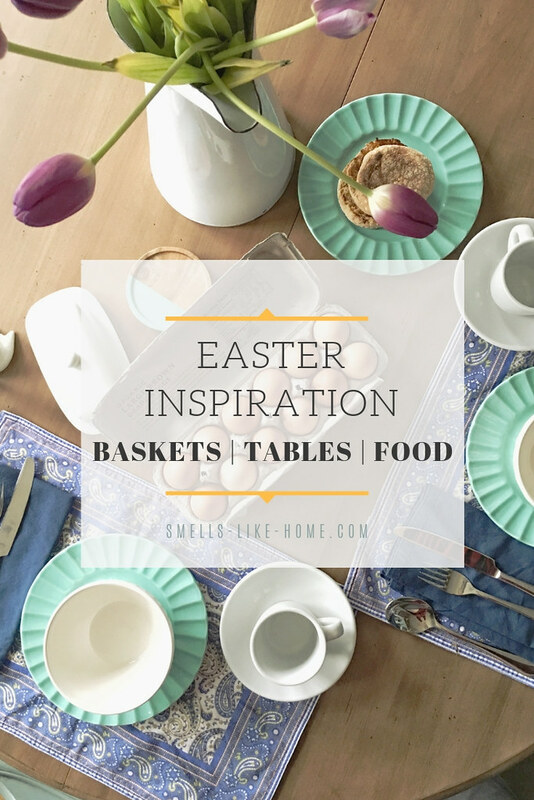 I thought I’d share some Easter inspiration with you in the form of what our Easters look like now with a toddler in the house. 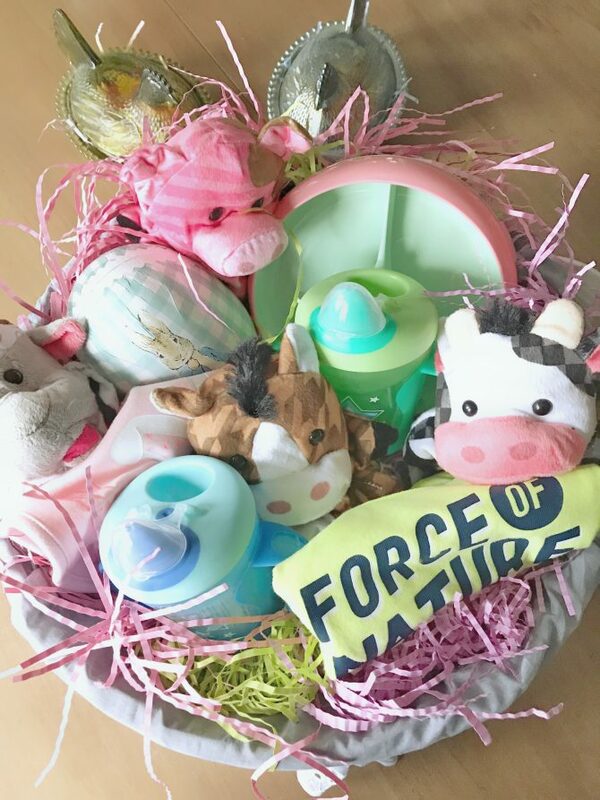 Obviously, we weren’t putting candy in a basket for an 9 month old last year so I went with some fun toys and things she need last spring, all buttoned-up in a pretty basket. 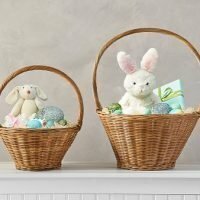 The ideas listed below are great suggestions for an infant's Easter basket. No candy, just fun, useful, and tested items that our 9 month old received for Easter. I chose a basket that will be hers to use every year rather than buying new ones each year. This one was just perfect. Classic, simple, and exactly my style! We added the adorable monogrammed liner because it was just too sweet to pass up. 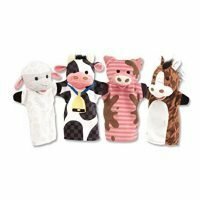 Riley was LOVING the imaginary play toys at school/daycare at 8/9 months so I thought these would be fun for home. At 21 months, she still plays with them frequently and we have a blast making farm animal sounds together! 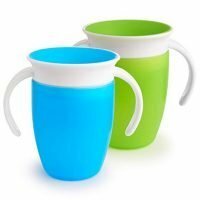 Riley received a different set of sippy cups in her 2018 Easter basket but I didn't love them enough to recommend them to you. The Munchkin 360 cups are the only cups she's used for almost a year and I'll never buy a different kind of sippy cup ever again. Pros: No spills, soft on her developing gums and teeth, easy to hold, cup works at all drinking angles (upside down), daycare labels stick really well through MANY dishwasher cycles. Cons: cups leak a little when dropped on hard floors. 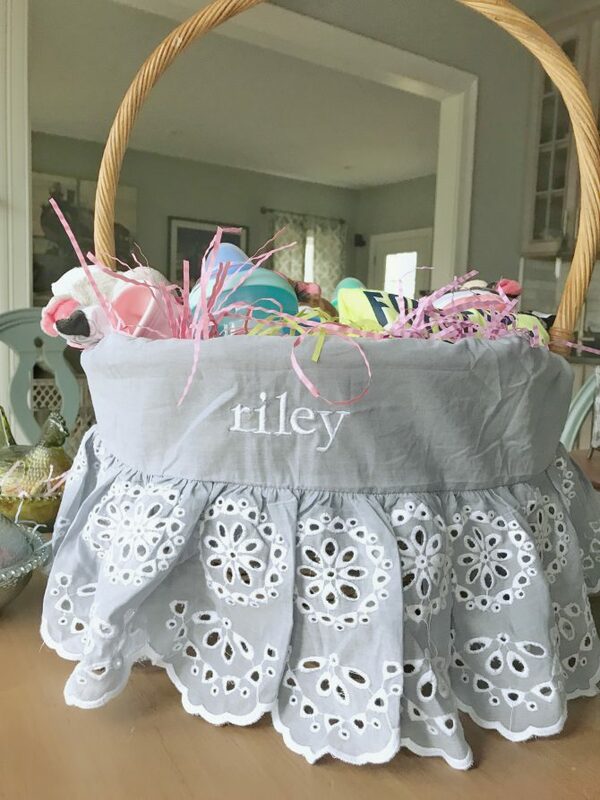 The onesie we added to Riley's 2018 Easter basket is no longer available at Target but any novelty onesie or t-shirt is a super cute non-candy idea for an Easter basket! This is one she wore A LOT last summer (daddy dresses her in the mornings - can you tell?). 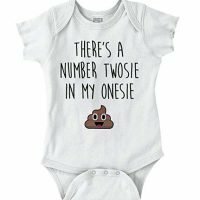 Amazon has a TON of these fun onesies available. 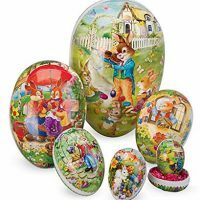 The set of nesting eggs we included in Riley's 2018 basket is no longer available on the Pottery Barn Kids site. But this set is a close second and it's almost exactly the same set I have from my childhood (a family heirloom). The set is a little pricey but if you're into vintage holiday decor, this is the set for you. 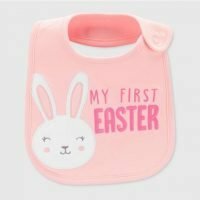 Carter's always makes the cutest bibs and I couldn't resist the 1st Easter bib. This is the 2019 version (2018 was very similar). The suction plate we included in Riley's 2018 Easter basket was a flop and it didn't work so I'm not going to recommend it. This ezpz mat is what we ended up purchasing and we love it. 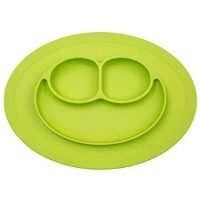 It's dishwasher safe on the bottom rack, comes in a bunch of fun colors, and really suctions to non-porous surfaces as it was made to do. This year with Riley closing in on 2 years old, it’s becoming even more fun to fill her Easter basket! We’re still not giving her candy (at least not that I know of lol) so I’ve been scouting around for fun stuff over the past few weeks. 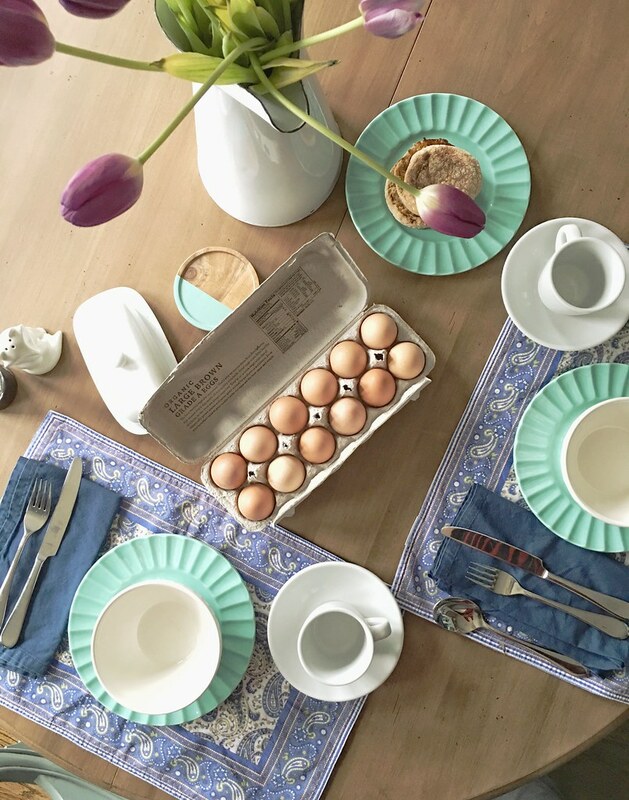 While I do adore the cute Peter Rabbit place settings I see everywhere these days, a simple color scheme works just as well. The turquoise plates you see here are some of my most favorite ever but unfortunately, they’re no longer available at Anthropologie. They were made to match the latte bowls and I’m so sad I can’t add to my current set any longer. 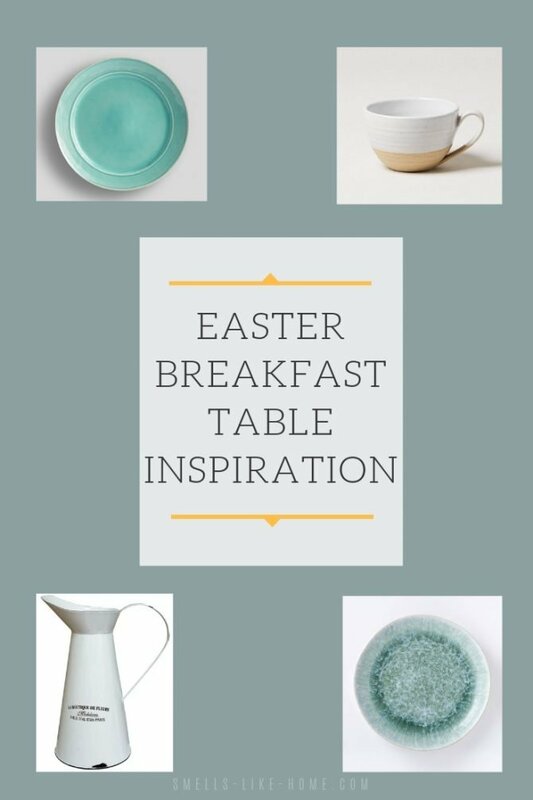 However, there are lots of fun and similarly colored plates out there that could work for an Easter table or a spring brunch. And what I love about not using Easter-themed plates with rabbits on them is that you can use these other plates all year long. The plates in the top left of the photo above are from Pottery Barn and the ones in the bottom right are from West Elm. The mug is my absolute favorite coffee mug and the enamelware pitcher is similar to the one I’ve had for years. 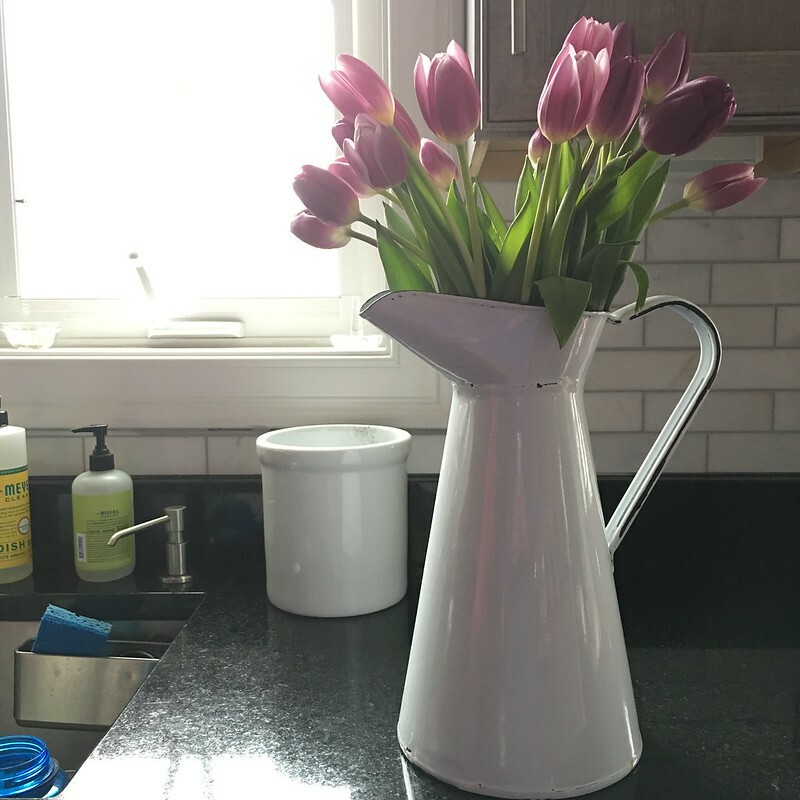 Simple flowers are always a sweet and refreshing touch for a springtime table. I regularly pick up bunches of various flowers from Trader Joe’s. They’re cheap and I love that I can easily mix-and-match the small bouquets they sell. 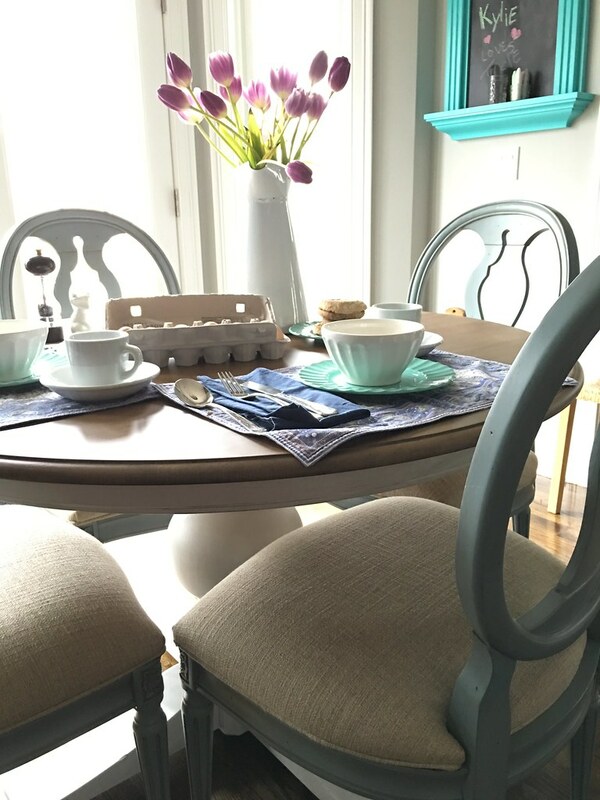 Without fail, our favorite Easter breakfast consists of egg salad on toasted and buttered English muffins (usually store-bought but homemade English muffins are delicious if you have some extra time! 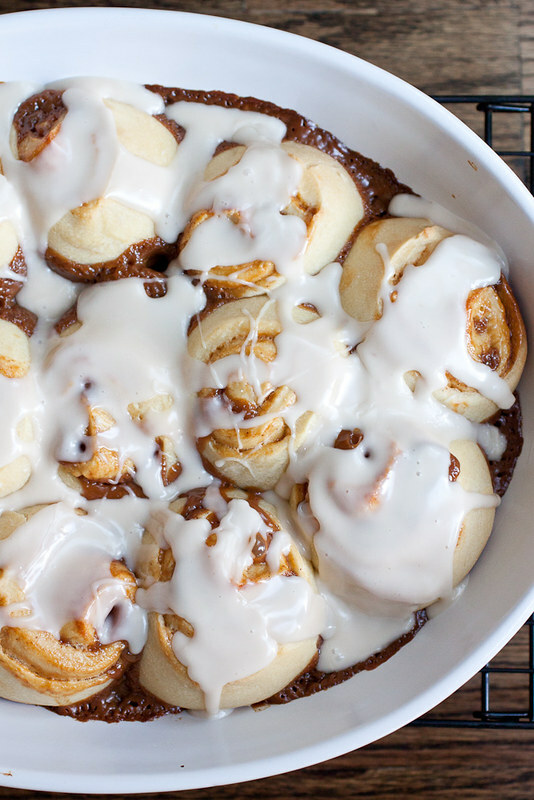 ), fruit salad, and cinnamon rolls. We tend to go fairly low-key for dinner on Easter since it’s just our little family. However, we always always always, eat kielbasa and deviled eggs as an appetizer the afternoon since we don’t eat lunch. For dinner, we also always make pierogi. It’s a Polish tradition that Kyle loves to keep going. We have made pierogi in the past and it’s A LOT of work for 2 people so now we buy it locally along with the local-made kielbasa. In years past, we’ve made filet mignon and scallops provençal as our main course with roasted carrots, and either herbed new potatoes or an easy batch of parmesan smashed potatoes. I’ve been thinking about making a baked ham this year and I’m excited to go in a different direction for the main course! We’ll see! As you can expect, dessert is my favorite course of any meal. 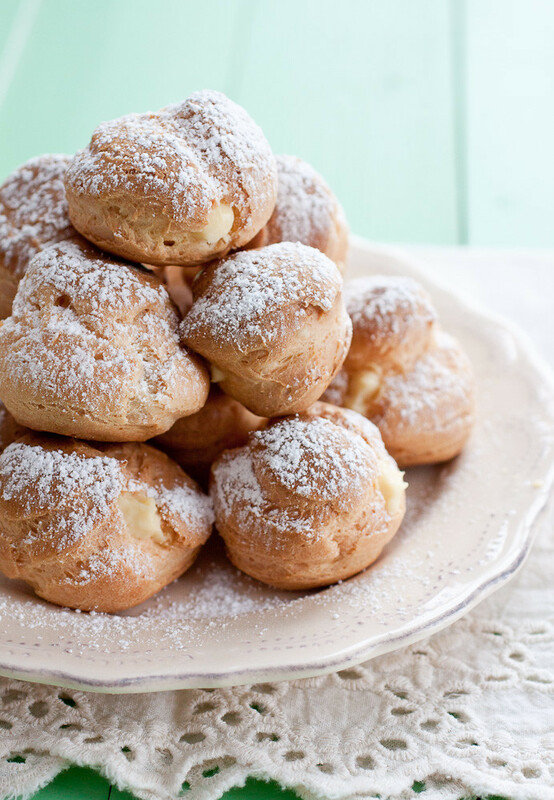 I love making dessert, eating dessert, and serving it to family and friends to enjoy. 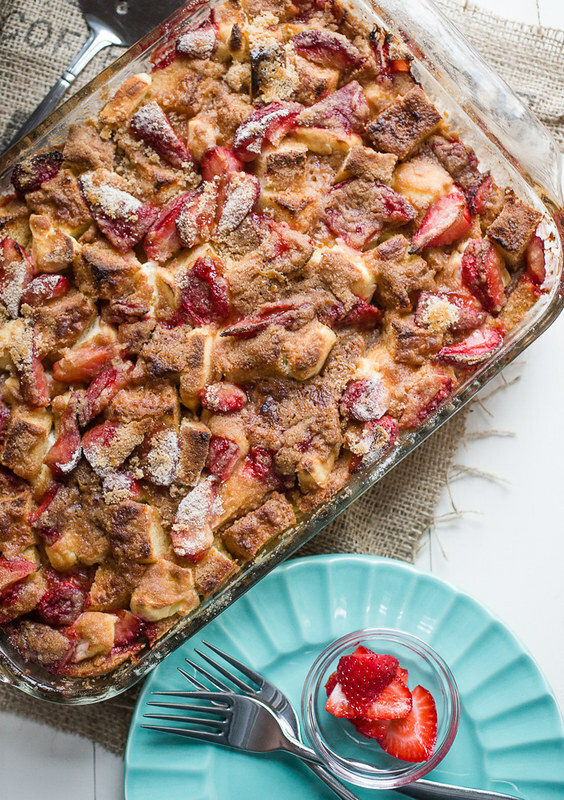 My strawberry jam French yogurt cake (above) made its first appearance a couple Easters ago and it was a giant hit! 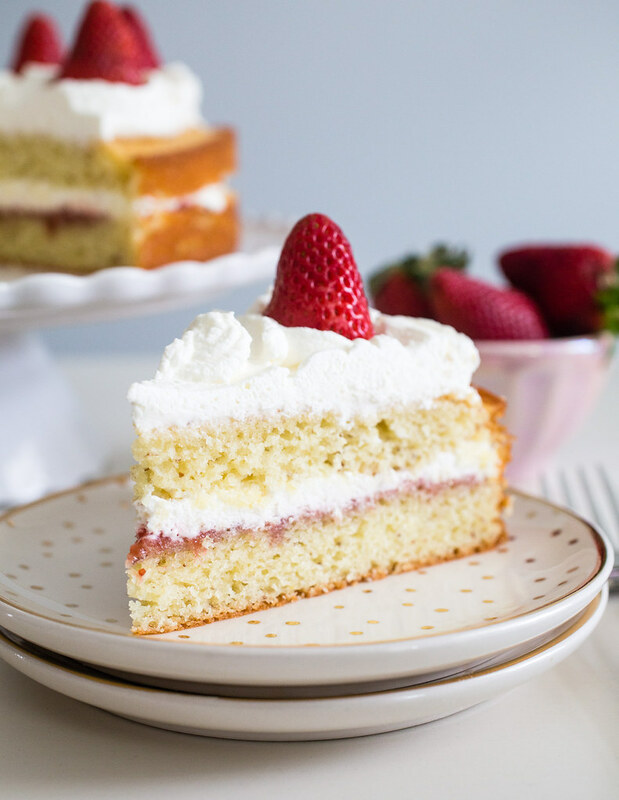 So so so easy to make too, since it’s only a 1 layer cake that’s split in half and filled with strawberry jam and whipped cream. 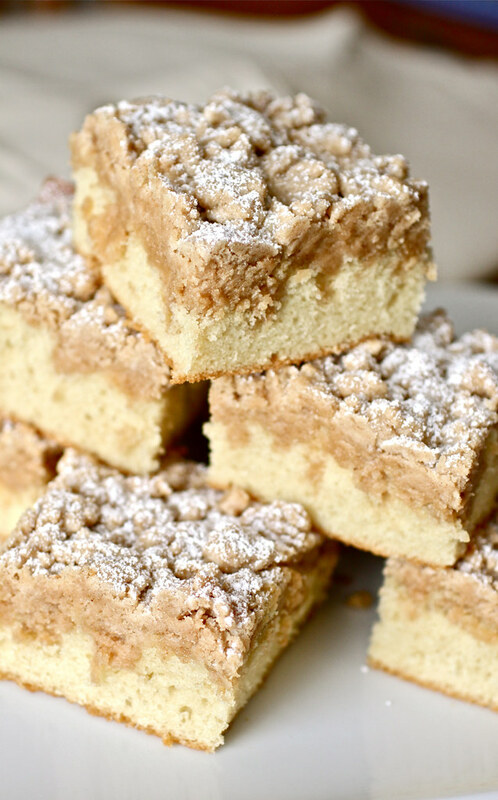 Cheesecake is ALWAYS a favorite dessert in my family. 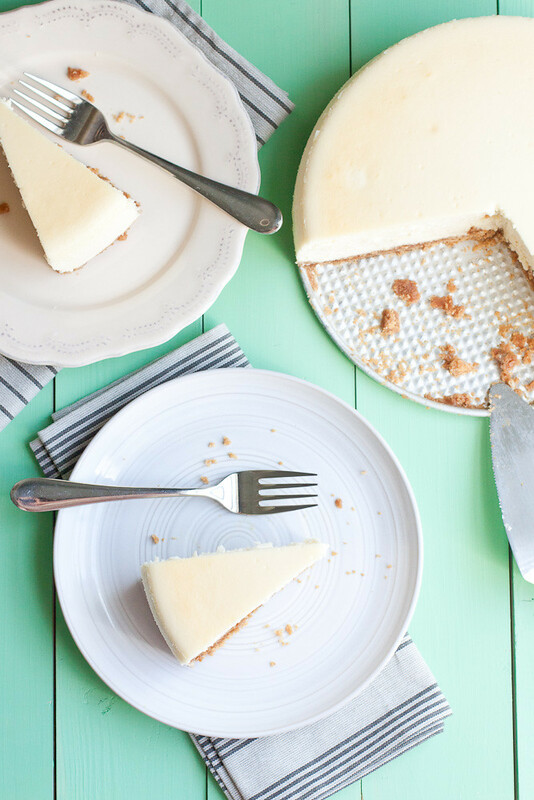 My tall & creamy cheesecake is a classic New York cheesecake that rivals any of the best cheesecakes in New York City. Trust me – I’ve tried them! It’s the creamiest cheesecake I’ve ever eaten and it’s absolutely delicious topped with strawberry sauce, salted caramel sauce, or hot fudge. We hope you have a fantastic Easter filled with lots of memories and great food! We’ve found since having James that we enjoy holidays so much more at home too!!! Love all these suggestions! Thanks, Kayle! Yes, the holidays at home with a little one are SO much easier and more enjoyable! Happy Easter to you and your family!